The China Recovered Paper Market: A Comprehensive Analysis and Outlook - Fastmarkets RISI - Objective Insight. Better Decisions. Consistent growth of recovered paper demand for over a decade has made China a key market impacting the global demand and supply of recovered paper. However, from 2009 to 2010 imports decreased by 2 million tonnes. This was due, in part, to a continued rise in domestic collection and relatively high prices. 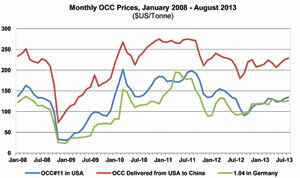 In 2012 imports increased over the previous 2009 high of 28 million tonnes. In 2013, China has seen slowing economic growth and sluggish paper and board demand. Understand how these conditions will impact China’s recovered paper demand and imports over the next 5 years with this new study. Taking a step beyond Fastmarkets RISI’s Outlook for Global Recovered Paper Markets, this new study covers demand, collection, trade and prices in China, by region. 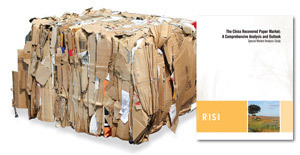 It analyzes the top producers and consumers of recovered paper in the country. It also examines how regulations will continue to affect not only China but the global market aiding strategic decision-making. This intelligence on the Chinese market helps recovered paper suppliers and consumers better understand how the demand/supply balance will be affected in other regional markets.